Back in April, the Wall Street Journal reported that Google was planning to adopt the Coalition for Better Ads list of standards and apply them to a filter built into Chrome. The guidelines warn against using annoying formats like large sticky ads and the dreaded autoplay video with sound. In June, the search giant confirmed that it would be moving forward with its own adblocker beginning in 2018. Thursday’s blog post announcing the autoplay changes appears to be the beginning of the wider rollout that would allegedly block four types of egregious ads on desktop and mobile. A Google spokesperson denies that the updates have anything to do with the Better Ads Standard or ads overall, the company is framing the new update as specifically targeting autoplay videos with sound. Of course, autoplay videos with sound are often ads. In October, the Chrome 63 release will add an option for users to disable audio completely on sites of the user’s choosing. That update will be followed by the initiation of new autoplay policies in the Chrome 64 release in January. Chrome will automatically stop videos from auto-playing unless the audio is muted, or it includes no audio at all. If the user tapped or clicked somewhere on the site during the browser session the video will be enabled. White listing will be available to mobile users by adding a website to the home screen and, on a desktop, the video will be allowed if the user “frequently played media on the site” based on standards outlined in the Media Engagement Index. There are a couple of ways to look at this development. On the one hand, internet advertising needs to change, people hate it and they’re doing their best to get around it. That’s bad for publishers and advertisers; publishers need the revenue and advertisers don’t want you associating their product with that time you scared the crap out of the office with a blaring ad. But there’s also the very real worry that Google is assembling the scaffolding to take over the few parts of digital advertising it doesn’t control yet. A report from the Interactive Advertising Bureau last July found that 26 percent of desktop users and 15 percent of mobile users are already using some form of adblocker, as marketers counteract that effort with more aggressive strategies, those numbers will surely continue to grow. Google makes billions on advertising and knows that this isn’t good for its future. It’s also not good for the ad-supported web. Like it or not, most websites survive on ad dollars, and there’s going to be a lot less free content if the ads aren’t getting served to users. According to the online analytics firm StatCounter, Chrome controls a little over 54 percent of the worldwide browser market. Safari is its closest competitor with 14 percent. Google is pretty much the only entity with the power to bully advertisers into creating a less abrasive browsing experience. Most people aren’t going to go into their settings to make adjustments, or even know that they can. Many sites will resist at first, but as they see their stats drop off over time, they’ll comply. Fewer annoying ads means fewer people shutting them off, more revenue for publishers, more impressions for advertisers, and happier users browsing. This, it would seem, is good for everyone. Unfortunately, the company’s adblocking effort gets far more problematic, as our greatest concern is now coming to fruition: Google is assembling its own list of “good” publishers. 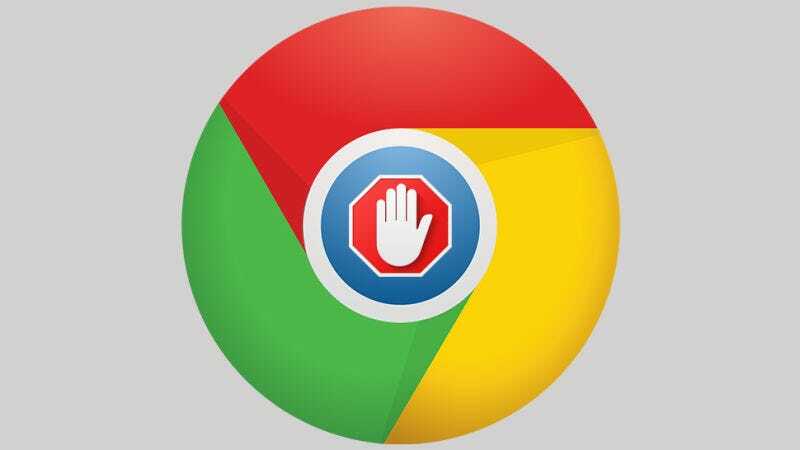 When the adblocking feature was first announced, we were hopeful that this move could be a positive development. One of our primary areas of concern was the possibility that Google would implement an “Acceptable Ads” list that websites can pay to be a part of. Google, along with other media giants like Amazon and Microsoft, reportedly pays Adblock Plus to white list its services. One unnamed company told the Financial Times in 2015 that the fee was “equivalent to 30 percent of the additional ad revenues that it would make from being unblocked.” Google is implementing a similar program called Funding Choices that allows approved websites to show users a popup when they visit the site. With this service, a user can be offered the option to pay a fee for an ad-free experience through the Google Contributor program. This option is simultaneously exciting and deeply troubling. For now, the Contributor service puts the control in publishers hands, giving them an option for what message to display when a user has an ad-blocker and if the publisher chooses, they can offer an ad-free experience that generates revenue for the publisher. If Google does move forward with a full ad-blocking program, this service could be used in a way that’s like Adblock Plus’s white list. Google very easily could begin taking a portion of the revenue for ad-free experiences and even impose its adblocker on any publisher that doesn’t participate in its program. But Adblock Plus is a much smaller company than Google and it’s not embedded in practically every facet of digital life. I’m far more comfortable with a small, independent company having control over a white list than I am with an unstoppable force like Google holding all the cards. Pushing advertisers to create a better browsing experience seems like it’s good for everyone. But as the public and regulators around the world are waking up to the urgent need to rein in Silicon Valley’s most dominant players, this seems like a weird time to start implementing a system that would give Google even more leverage in its field. At a certain point, people have to ask if a company is only a monopoly when it abuses its power, or if it’s already a monopoly because of its potential to abuse that power. Update 9/18: This post has been modified to clarify that Google is targeting all autoplay videos, not just ads. And that Google is not offering its own premium whitelisting service, yet.